Having defeated Temasek Junior College (TJC) 7-2 in the preliminary stage of competition, RI’s A Div water polo girls no doubt entered Thursday’s final against the very same opponents with some degree of confidence. Back-and-forth cheering between the TJC supporters and RI councillors, as well as some prospective Council nominees, preceded the start of the match at MOE Co-Curricular Activities Branch. While the TJC supporters came armed with plastic clappers, the banners hung at the RI end of the pool and the drum brought along by CCAD for coordinating cheers ensured that our supporters were not outclassed. The match started somewhat slowly, with both goalkeepers saving long shots across the pool, but soon gained speed. After a disallowed goal, RI managed to keep the ball in TJC’s half for a full minute, and the pressure produced results when Richelle Ang (#8) finally managed to send the ball past the goalkeeper. This energised the RI team, which continued to dominate possession and keep the ball in the Temasek half. The second goal came two minutes later in dramatic fashion when a shot on target hit the top of the Temasek cage, bounced back and was palmed past the TJC goalkeeper by Clarinda Tan (#6), triggering cheers of “Raffles Dynamite” from the councillors. Later, RI coach Mr Lim Yao Xiang would remark that the girls displayed such confidence that all that remained for him was to “take a back seat and let them play their own game”. In the second quarter, RI seized possession and made it 3-0 20 seconds in. This time round, TJC put up a more resolute defence and the fourth goal only came 3 minutes later from a remarkable shot over the entire Temasek defence line. Despite a stout defence, Temasek still could not get the ball out of their half. More drama ensued after a RI was awarded a penalty shot, which unfortunately sailed over the cage. Moments later, RI substituted four players, increasing the speed of the game, and Rachel Lee (#12), one of the four new players, immediately found her mark as she scored a shot over three Temasek defenders. Incredible defending by goalkeepers Joanna Chue (#1) and Stephanie Sim (#13), as well as two lightning shots by Neo Serhan (#7) in rapid succession, ensured RI led by a margin of 7-0 at halftime, giving the councillors good reason to put up an intimidating display of “Rafblood” and “Ichiban” cheers. In the second half, Temasek ramped up the pressure but failed to capitalise on the RI defence, being repeatedly frustrated by the time limit of 30 seconds they had to attack the opposing goal. The TJC goalkeeper, repeatedly shouting a ten-second countdown across the pool to encourage her team members, made quite a few excellent saves, and the pace of scoring slowed. Nethania Low (#10) and Rachel Lee (#12) nonetheless managed to score one more goal each, making it 9-0 before the final quarter. The final quarter commenced with a spate of fouls and determined marking of RI players by their Temasek opponents. Determined to stop conceding goals, TJC further intensified the pressure on RI forwards, with 3 defenders challenging one RI player holding the ball on more than one occasion. Rising to the occasion, RI mounted a comprehensive attack on the Temasek defence, resorting to long passes with unerring accuracy over TJC players, and Clarinda Tan (#6) of the RI team finally made it 10-0 before Richelle Ang (#8) found her shot saved twice. In the nerve-wracking last minute of the game, Temasek finally found the RI cage with a long shot from the halfway line, but subsequent attempts on goal were stymied and the final ended with raucous cheering from the RI supporters. After the match, coach Mr Lim Yao Xiang admitted that they “didn’t expect to win by so much”, but also remarked that the girls “fully deserved” their win because “they trained really hard and even throughout last year’s promos they did not stop training on their own just to improve”. He also said that the team was one of the “most united teams [he had] coached so far” and that their “chemistry on land [was] really reflected in the pool”, which explained their fitting win. They put in a lot of effort more than the competition. Every holiday they will ask whether they can come back to school for extra training, so I’m the one that needs to say ‘give me a rest’, so that says a lot. On Thursday mornings they start swimming at 6am at the RI Hong Leong pool in the cold, in the dark for an hour. That’s something that no one actually knows [so] they deserve every bit of their victory. 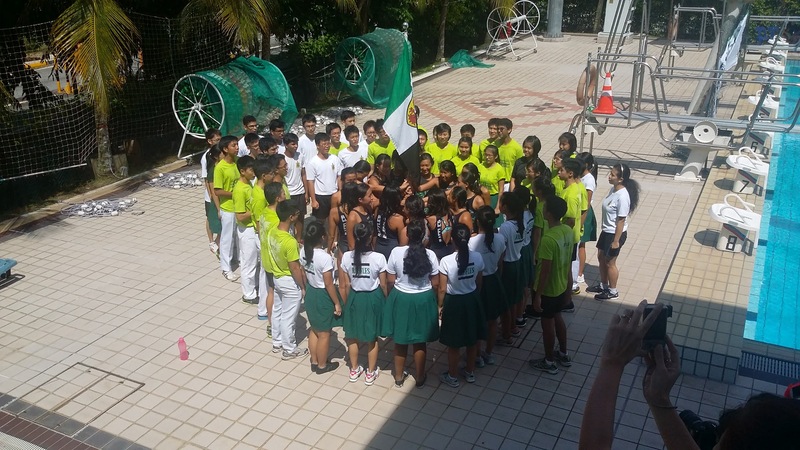 Raffles Press would like to congratulate the A Div Girls’ water polo team on defending their National Champions title for the 8th year running, and wishes all sports CCAs well in their matches and games to come.